If you grew up in the 1990's Victoria Beckham nee Adams was a household name. While we were singing in the bathroom with our hairbrush microphone, this Posh Spice was transforming herself from Spice Girl to Fashion Style Icon. For Victoria the rise to fashion's highest mention has been a long journey with many memorable outfits and style reinventions. From the days of Spice Girls where monochrome palettes and sleek hair ruled, she had even then made a statement. From the film "Spice World" the most famous line from that movie was Mel C telling Victoria to wear "the little Gucci dress, the little Gucci dress, Or- the little Gucci dress" We knew at that moment Victoria was bound for fashion greatness. Beckham made a guest appearance on the catwalk for Maria Grachvogle on February 17, 2000, making her debut as a model at London Fashion Week. She also acted as a British ambassador for Dolce and Gabbana and was briefly the face of Rocawear. She first designed a limited-edition fashion line for Rock & Republic called VB Rocks in 2004, consisting mainly of jeans. In 2006, Victoria walked the runway for Roberto Cavalli at Milan Fashion Week, and was for a period exclusively dressed by him for red-carpet and social events. 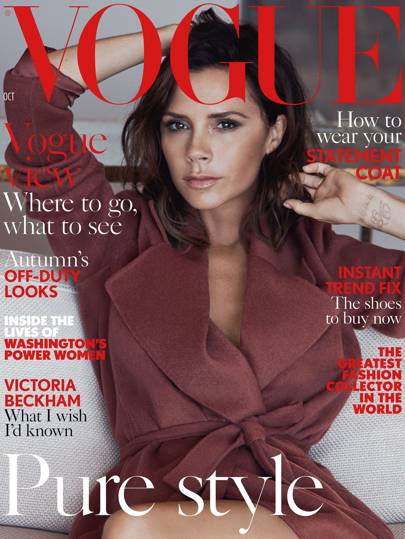 Beckham has graced countless fashion magazine covers during her career. Her first Vogue appearance was February 2004 for her solo Vogue cover for the Spanish edition. This was followed by Vogue India, Vogue Paris as well as the British, German, Russian, Australian, Turkish, Taiwanese & Chinese editions. She has also graced various international Harper's Bazaar and Elle. Here is her very first solo Vogue cover and her most recent October 2018 edition. Beckham's label was launched in September 2008 in a low-key presentation. By 2011, it had grown into a fixture of New York Fashion Week! Known initially for its dresses, the line expanded into separates and luxury handbags. Alongside the main fashion line, the Victoria Beckham brand still includes separate denim, eyeware and fragrance lines. This line would not be complete without a line of eyeware, in 2006 Harper's Bazaar Victoria admitted to a personal love of sunglasses, saying "I'm quite obsessed with sunglasses. I collect vintage Guccis and Carreras. They can make virtually any outfit look cool." Nowadays, when Beckham steps out you hardly ever see her without a pair of sunny's. Victoria Beckham had made the transition from novelty to respected designer, citing her editorship of French Vogue and her participation in a panel discussion with the dean of Parsons design school in New York. In 2018 her collection was presented at London Fashion Week instead of at New York Fashion Week as normal. Sunday November 11, 2018 Victoria was honored with the Fashion Icon Award at the People Choice Awards and accepted her prize in true Beckham fashion, wearing a chic all-white blazer - and - trouser ensemble. During her acceptance speech, she thanked the firefighters who were working tirelessly to help battle the devastating California wildfires, and gave a call to all others like her who dream big - referencing a lyric from the Spice Girls "Wannabe". "I always told myself, 'Dream big and then dream even bigger.' I wanted to show that if i can do it, anyone can do it. And what you can achieve really can be limitless," said the singer and fashion designer, 44, adding with a signature Girl-Power peace-sign hand gesture, "I can't help it - if you really, really want it, okay?" Congratulations Victoria Beckham on being the 2018 Fashion Icon! Are you a fan of free things?